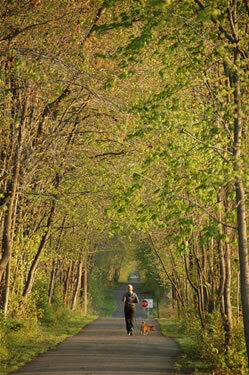 This paved, 10-foot wide, 24-mile long trail is a former railroad right-of-way. It is relatively flat, traveling through both man-made and natural environments. 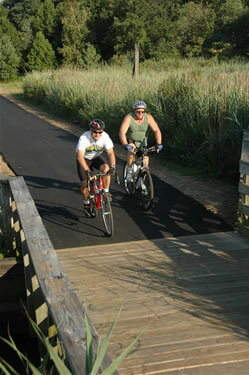 Much of the trail is tree-lined, though some parts have views of surrounding wetlands, streams and fields. The Henry Hudson Trail Activity Center is located on Hwy 36, Leonardo near the intersection Hwy 36/Avenue D, Atlantic Highlands. The northern trail section runs 12 miles (just north of and parallel to Rt. 36) from the Aberdeen/Keyport border at the intersection of Lloyd Rd. and Clark St. to the Leonardo section of Middletown/Atlantic Highlands border at Avenue D. After sharing the road, the trail resumes at the Atlantic Highlands Marina and continues along Sandy Hook Bay to Popamora Point on Atlantic Highlands - Highlands border. 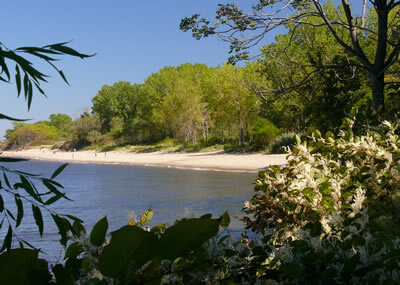 Currently, the trail runs four miles from Rt. 537 in Freehold to Big Brook Park in Marlboro. The trail then resumes at Station Road in Marlboro and continues for five miles to Church Street in Matawan. Future plans for the Trail include linking these two sections of trail and providing a connection to the original, northern section of the Henry Hudson Trail. The park totals 100 acres. Please remember that all saltwater anglers (age 16 and up) in New Jersey need to register or re-register with the state's free saltwater fishing online registry.